A new endemism for the Azores: the case of Centaurium scilloides (L. f.) Samp. Centaurium scilloides is a very isolated taxon, taking into account morphological characteristics, chromosome number, and disjunct Atlantic distribution. 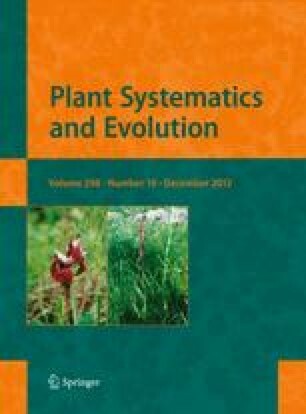 Comparison of the Azorean plants with those living in mainland Europe reveals significant differences, which question their assimilation into a single taxon. Our molecular data inferred from sequences of nrDNA (internal transcribed spacer, ITS) and plastid regions (trnL intron and trnL-F spacer), confirmed the hypothesis that plants of C. scilloides from the Azores archipelago are different than those distributed on the Atlantic coasts of Europe, and both should, consequently, be treated as independent species. As a result, a new systematic treatment is proposed. J. A. F. Prieto and E. Cires contributed equally to this work. We would like to thank Candela Cuesta and three anonymous reviewers for useful comments that improved the manuscript. We are grateful to Mark Spencer (The Natural History Museum, Herbarium BM), Elaine Charwat (Linnean Society of London, Herbarium LINN), Caroline Loup (Muséum National d’Histoire Naturelle, Herbarium P), and Dalila Espírito-Santo (Instituto Superior de Agronomia, Herbarium LISI) for help with type specimens, and María Ceballos, Víctor M. Vázquez, and Carlos Aguiar for helping with the sampling. Plant material analysed in this study. Voucher information and GenBank accessions for ITS (ITS1 and ITS2) and cpDNA regions (trnL intron and trnL-F spacer) are reported. Sequences directly retrieved from GenBank are in italics. Blackstonia grandiflora (Viv.) Maire, G. Mansion MG010832 (NEU), Spain, AY251684, AY251714; B. imperfoliata (L. f.) Samp., G. Mansion MG010833 (NEU), Spain, AY251685, AY251715 (under the name B. acuminata Domin); B. perfoliata (L.) Huds., 1, G. Mansion MG98712 (NEU), France, Provence, Le Frigolet Abbey, AY047793, AY047878; 2, L. & N. Zeltner 2050 (NEU), Spain, AY251686, AY251716; Centaurium barrelieri (Dufour) Font Quer & Rothm., 1, L. & N. Zeltner MG981106 (NEU), Spain, Catalogne, Mora de Ebro, AY879805, AY879856; 2, C. Monnerat MG010101 (NEU), Spain, AY879806, AY879857; C. bianoris (Sennen) Sennen, 1, A. Guggisberg & G. Mansion AG0108-28b (NEU), Spain, Majorca, between Orient and Bunyola, AY879808, AY879859; 2, A. Guggisberg & G. Mansion AG0108-10T-13 (NEU), Spain, Majorca, between Orient and Bunyola, AY879809, AY879860; 3, A. Guggisberg & G. Mansion AG0108-30 M (NEU), Spain, Majorca, between S’Arraco and Sant Elm, AY879807, AY879858; C. cachanlahuen (Molina) B.L. Rob., 1, L. Zeltner 020501 (NEU), Chile, AY251694, AY251724; 2, L. Zeltner 020502 (NEU), Chile, AY251695, AY251725; C. capense Broome, L. & N. Zeltner MG98706 (NEU), Mexico, Baja California, Rio Bocana, AY047789, AY047874; C. centaurioides (Roxb.) Rolla Rao & Hemadri, L. & N. Zeltner MG990241 (NEU), India, Bodhgaya, AY879810, AY879861; C. chloodes Samp., L. & N. Zeltner MG981112 (NEU), Spain, La Coruña, Playa de Carnota, AY879811, AY879862; C. erythraea Rafn, 1, Anonymous 717367 (MEL), Australia, AY251669, AY251699; 2, G. Mansion MG990242 (NEU), France, Gard, Poulx, AY879812, AY879863; 3, G. Mansion MG990243 (NEU), France, Gard, Espiguette, AY879813, AY879864; 4, G. Mansion MG990703 (NEU), Spain, Majorca, AY879814, AY879865; 5, MG001002 (MEL 2067477), Australia, Burrowa Mountain National park, AY879815, AY879866; 6, L. & N. Zeltner MG001211 (NEU), Australia, William Bay National Park, AY879816, AY879867; C. erythraea subsp. rumelicum (Velen.) Melderis, L. & N. Zeltner MG991007 (NEU), Spain, Larouco, Orense, AY879838, AY879889; C. erythraea var. subcapitatum (Corb.) Ubsdell, 1, L. & N. Zeltner MG010201 (NEU), Eire, Carraroe, AY879843, AY879894; 2, L. & N. Zeltner MG010202 (NEU), North Ireland, Murlough, AY879844, AY879895; C. erythraea × C. littorale,1, L. & N. Zeltner MG010818 (NEU), Denmark, Jutland, Sand Milen, AY879817, AY879868; 2, L. & N. Zeltner MG010819 (NEU), Denmark, Jutland, Sand Milen, AY879818, AY879869; 3, L. & N. Zeltner MG010820 (NEU), Denmark, Jutland, Sand Milen, AY879819, AY879870; C. favargeri Zeltner, L. & N. Zeltner MG981105 (NEU), Spain, Cubells, AY251670, AY251700; C. gypsicola (Boiss. & Reut.) Druce, L. & N. Zeltner MG990244 (NEU), Spain, Titulcia-Chinchon, AY251671, AY251701; C. littorale (Turner) Gilmour, 1, L. & N. Zeltner MG98904 (NEU), UK, England, Holy Island, AY251672, AY251702; 2, L. & N. Zeltner MG010808 (NEU), Danemark, Lakolk, Romo Island, AY879820, AY879871; 3, L. & N. Zeltner MG010811 (NEU), Denmark, Jutland, Skallingen, AY879821, AY879872; 4, L. & N. Zeltner MG010814 (NEU), Denmark, Jutland, Skallingen, AY879822, AY879873; 5, L. & N. Zeltner MG010817 (NEU), Denmark, Jutland, Sand Milen, AY879823, AY879874; C. littorale subsp. uliginosum (Waldst. & Kit.) Rothm. ex Melderis, L. & N. Zeltner MG991005 (NEU), Sweden, Gotland, Herrvik, AY879854, AY879905 (under the name C. uliginosum (Waldst. & Kit.) Fritsch); C. mairei Zeltner, 1, L. & N. Zeltner MG991004 (NEU), Niger, Audegil, AY879824, AY879875; 2, L. & N. Zeltner MG030908 (NEU), Iran, Amirabad, AY879825, AY879876; C. majus (Boiss.) Druce, 1, L. & N. Zeltner MG97411 (NEU), Spain, Alcala de los Gazules, AY879826, AY879877; 2, L. & N. Zeltner MG981108 (NEU), Spain, Bujalance, AY879827, AY879878; C. majus subsp. rhodense Zeltner, N. Schoenberger MG001022 (NEU), Italy, Sicily, Plla del Bafurco, AY879837, AY879888; C. malzacianum Maire, 1, L. & N. Zeltner MG98901 (NEU), North Yemen, Habab, AY879828, AY879879; 2, G. Mansion, L. & N. Zeltner MG000402 (NEU), Oman, Waddi Bahni Gahfir, before Murri, AY879829, AY879880; 3, G. Mansion, L. & N. Zeltner MG000408 (NEU), Oman, Waddi Kabab, AY879830, AY879881; 4, G. Mansion, L. & N. Zeltner MG000410 (NEU), Oman, boundary with Arabian Emirates, near Buraimi, AY879831, AY879882; 5, G. Mansion, L. & N. Zeltner MG000412 (NEU), Oman, oasis of Ghasyzayn, on the road to Ibri, AY879832, AY879883; C. maritimum (L.) Fritsch, 1, G. Mansion MG98703 (NEU), France, Baillaury valley, near Banyuls-sur-mer, AY251673, AY251703; 2, L. & N. Zeltner MG030102 (NEU), France, Provence, Hyères Islands, AY879833, AY879884; 3, L. & N. Zeltner MG030104 (NEU), France, Provence, Hyères Islands, AY879834, AY879885; C. portense (Brot.) Buchner, 1, M. Ceballos & J.A. Fdez. Prieto, 32682 (FCO), Spain, Asturias, El Franco, Cabo Blanco, JX124283, JX124298; 2, M. Ceballos & J.A. Fdez. Prieto, 32683 (FCO), Spain, Asturias, Gozón, Cabo de Peñas, JX124284, JX124299; 3, M. Ceballos & J.A. Fdez. Prieto, 32681 (FCO), Spain, Asturias, Gijón, Campa del Cabo de Peñas, JX124284, JX124299; 3, M. Ceballos & J.A. Fdez. Prieto, 32681 (FCO), Spain, Asturias, Gijón, Campa del Cabo Torres, JX124285, JX124300; 4, M. Ceballos & J.A. Fdez. Prieto, 32680 (FCO), Spain, Cantabria, Piélagos, JX124286, JX124301; 5, L. & N. Zeltner MG981111 (NEU), Spain, Playa de Baldaio, AY251675, AY251705, AY251737, AY251761 (under the name C. scilloides (L. f.) Samp., see Mansion et al. 2005); 6, L. & N. Zeltner MG031201 (NEU), Chile, Los Molinos, Valdivia, AY879839, AY879890, AY879940, AY879998 (under the name C. scilloides (L. f.) Samp., see Mansion et al. 2005); 7, L. & N. Zeltner MG031202 (NEU), Chile, Curinanco, AY879840, AY879891, AY879941, AY879999 (under the name C. scilloides (L. f.) Samp., see Mansion et al. 2005); C. pulchellum (Sw.) Druce, 1, G. Mansion MG98505 (NEU), France, Hautes-Alpes, near Gap, AY047787, AY047872; 2, G. Mansion, L. & N. Zeltner MG97701 (NEU), U.S.A., Texas, Houston Airport, AY879835, AY879886; 3, L. d’Andrea, A. Guggisberg & G. Mansion L2-1 (NEU), Italy, Sardinia, San Michele de Plaianu church, AY879836, AY879887; C. scilloides (L. f.) Samp., 1, A. Bueno Sánchez & J.A. Fdez. Prieto, 32676 (FCO), Portugal, Islas Azores, Ilha do Faial, JX124287, JX124302; 2, A. Bueno Sánchez & J.A. Fdez. Prieto, 32675 (FCO), Portugal, Islas Azores, Ilha do Faial, JX124288, JX124303; 3, A. Bueno Sánchez & J.A. Fdez. Prieto, 32672 (FCO), Portugal, Islas Azores, Ilha do Pico, JX124289, JX124304; 4, A. Bueno Sánchez & J.A. Fdez. Prieto, 32674 (FCO), Portugal, Islas Azores, Ilha do Pico, JX124290, JX124305; 5, A. Bueno Sánchez & J.A. Fdez. Prieto, 32673 (FCO), Portugal, Islas Azores, Ilha do Pico, JX124291, JX124306; 6, A. Bueno Sánchez & J.A. Fdez. Prieto, 32679 (FCO), Portugal, Islas Azores, Ilha de São Miguel, JX124292, JX124307, JX124313, JX124317; 7, A. Bueno Sánchez & J.A. Fdez. Prieto, 32678 (FCO), Portugal, Islas Azores, Ilha de São Miguel, JX124293, JX124308, JX124314, JX124318; 8, A. Bueno Sánchez & J.A. Fdez. Prieto, 32677 (FCO), Portugal, Islas Azores, Ilha de São Miguel, JX124294, JX124309; 9, C. Aguiar & J.A. Fdez. Prieto, 32670 (FCO), Portugal, Islas Azores, Ilha do Corvo, Estrada para o Caldeirao, JX124295, JX124310, JX124315, JX124319; 10, C. Aguiar & J.A. Fdez. Prieto, 32671 (FCO), Portugal, Islas Azores, Ilha de Santa Maria, Santa Cruz do Pico, JX124296, JX124311; C. serpentinicola Carlström, L. & N. Zeltner MG001017 (NEU), Turkey, Köycegiz, AY879841, AY879892; C. somedanum M. Laínz, 1, A Bueno, V. Vázquez & J.A. Fdez. Prieto, 32701 (FCO), Spain, Asturias, Somiedo, La Redibobia, JX124297, JX124312, JX124316, JX124320; 2, L. & N. Zeltner MG98501 (NEU), Spain, La Riera, AY879842, AY879893, AY879943, AY880001; C. suffruticosum (Griseb.) Ronniger, G. Mansion MG010802 (NEU), Spain, between Jimena de la Frontera and La Sauceda, AY879845, AY879896; C. tenuiflorum subsp. acutiflorum (Schott) Zeltner, 1, L. d’Andrea, A. Guggisberg & G. Mansion D1-7 (NEU), Spain, Majorca, Maratxinet, AY879846, AY879897; 2, L. d’Andrea, A. Guggisberg & G. Mansion D2-1 (NEU), Spain, Majorca, Torrent de Pareis, AY879847, AY879898; C. tenuiflorum subsp. tenuiflorum (Hoffmanns. & Link) Fritsch ex Janch., 1, L. & N. Zeltner 1766 (NEU), Morocco, AY251674, AY251704; 2, L. d’Andrea, A. Guggisberg & G. Mansion F3-9 (NEU), Spain, Jimena de la Frontera, AY879848, AY879899; 3, L. d’Andrea, A. Guggisberg & G. Mansion G1-3 (NEU), Spain, road between Puerto de Galis and Ubrique, AY879849, AY879900; C. turcicum (Velen.) Bornm., 1, L. & N. Zeltner MG991008 (NEU), Georgia, Agara, AY879850, AY879901; 2, L. & N. Zeltner MG001018 (NEU), Turkey, Phrygie, Pamukkale, AY879851, AY879902; 3, L. & N. Zeltner MG001019 (NEU), Turkey, Phrygie, Beysehir, AY879852, AY879903; 4, L. & N. Zeltner MG001020 (NEU), Turkey, Pamphylie, Aksu-Isparta, AY879853, AY879904; Chironia baccifera L., M. Callmander & S. Wohlhauser A005 (NEU), South Africa, AY251690, AY251720; C. laxa Gilg, M. Callmander & S. Wohlhauser A003 (NEU), South Africa, AY251691, AY251721; C. linoides L., M. Callmander & S. Wohlhauser A004 (NEU), South Africa, AY251692, AY251722; Cicendia quadrangularis (Lam.) Griseb., P. Maas 8154 (U), AY251682, AY251712; Ixanthus viscosus (Aiton) Griseb., P. Küpfer s.n. (NEU), Spain, Tenerife, AY251683, AY251713; Orphium frutescens (L.) E. Mey., M. Callmander & S. Wohlhauser A001 (NEU), South Africa, AY251693, AY251723.